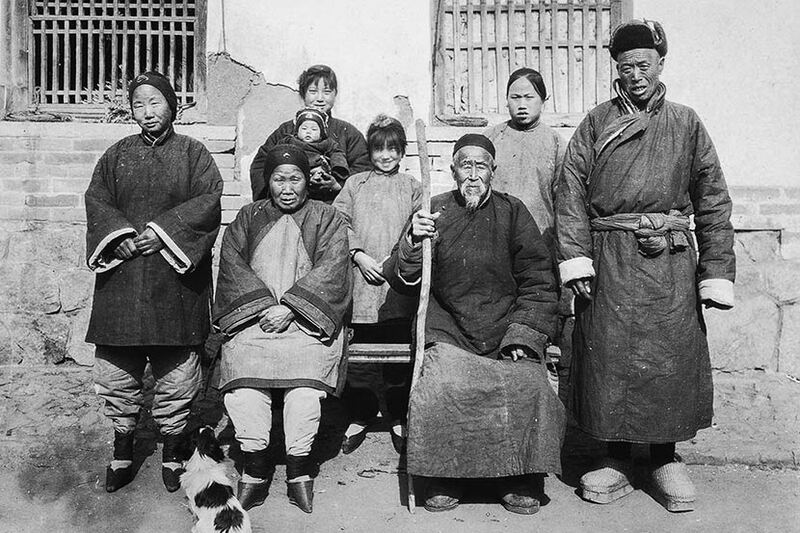 France China Archives is an open-access platform that inventories photographic archives of China located in France. It encompasses private and public holdings, whose content cover the period 1840s to the present. It is designed to provide a scholarly digital space for the study of the variety of photographic practices in China, while making accessible French resources to the scholarly community, students, and the general public. Site created by Marine Cabos-Brullé in collaboration with InVisu (CNRS/INHA) and Centre d’études sur la Chine moderne et contemporaine - UMR-8173 Chine, Corée, Japon (EHESS/CNRS). Hosted by TGIR Huma-num. Feng Keli is the founder and the editor-in-chief of “Old Photos,” a Chinese-language series of publications that collects images of the country’s modern history. Since 1996, these publications showcased countless family portraits taken during the 19th and 20th centuries. They allow us to catch a glimpse of the everyday lives of Chinese people during the course of the country’s tumultuous recent history. Feng Keli recently wrote several articles about these publications for Sixth Tone, an online publication that produces informed and insightful content on contemporary China. Study Day: "John Thomson: Reframing Materials, Images, and Archives"
John Thomson’s (1837-1921) large surviving archive has helped to secure his place in the canon of British photography. The Archive includes some 600 negatives at the Wellcome collection, as well as an extensive list of published works, surviving glass-plate negatives, cartes de visites, and album prints. Such an archive has generated interest in Thomson’s photographs as historical and cultural documents, an illustration of how the existing discourse on Thomson’s work remains tied to the perceived indexical values of his photographs. This event is organised in conjunction with the 2018 exhibition at the Brunei Gallery, SOAS (13 Apri - 23 June 2018), Through the Lens of John Thomson 1868-1872: China, Siam and Angkor. The key themes are the production, reproduction, circulation, exhibition, and the archival value of John Thomson’s work. As such, this study day will provide an opportunity to contextualise and stimulate new research questions around the materiality and visuality of photography. These discussions also have wider implications within the scholarship of photography across the fields of Art History, Anthropology, Visual and Material Cultures, History, Architecture and Dress History. Critically, the programme will endeavour to illuminate and problematise new debates on Thomson’s work. Academics, curators and practitioners will present research and engage in discussion around four specific key themes: The Interrelation and Interaction of Making, Translating and Transforming Images into Objects, Reading and Reframing of Images - Issues of the Archive, and Constructing and Conceptualising East and Southeast Asia. As such, this Study Day will provide an opportunity to contextualise and stimulate new research questions around the materiality and visuality of photography. These discussions also have wider implications within the scholarship of photography across the fields of Art History, Anthropology, Visual and Material Cultures, History, Architecture and Dress History. On this occasion, Photography of China’s founder Marine Cabos will present a paper entitled “From Physical to Digital: The Many Lives of Photographic Archives”, which will offer an investigation into a recently created database entitled “France-China Archive”. This platform inventories public and private repositories of photographs taken in China since the second half of the nineteenth century, which today are located in France. Book Highlight | Tong Bingxue's "History of Photo Studios in China, 1859–1956"
If you are in the South of France, don’t miss the Festival Boutographies, where Patrick Wack’s “Out West” photographic series is currently exhibited. In this series, Wack has intertwined a romantic vision of the Xinjiang region with the American Far-West. We are honoured to officially announce that Photography of China is now a non-profit association, whose mission remains to continue the wide circulation of knowledge about photographic practices from China. As we launch our association, we appeal to you to support our work with a minimum donation. Your contribution will go directly into our operating budget. Your generosity is important, no donation is too small. To recognize your support, your name will appear on our website and will be included in e-newsletter communications to our readers. We thank each of our donors for their loyalty and enthusiasm, and look forward to working with new friends as we build for the future! Read the exclusive interview of the Hong Kong-born photojournalist Liu Heung Shing. PHOTO MACAU | Art Fair is Asia’s newest international art fair dedicated to art photography and moving image, which aims to bring world-class fine art photography and video to one of Asia’s fastest growing economies. Through a carefully curated collection of art and photo galleries from around the world, Photo Macau aims to bring together the world’s leading photographers, curators, collectors, dealers and art lovers to become the art fair of reference in Asia for photography and moving image. At the heart of the quickly-expanding art and cultural scene in Asia, Photo Macau contemporary art photography fair will bring together creative talents from Asia and beyond to promote and celebrate photography and video art, which are rapidly gaining recognition in the region. Through their partners’ support and the expertise and dedication of our international board of advisers – made up of curators, critics and museum directors – PHOTO MACAU | Art Fair will create a platform for those already won over by multimedia and new media art, as well as those looking to expand their knowledge by meeting and interacting with other art enthusiasts and experts in this field. Photo Macau is a good chance to meet and explore the world of emerging artists on the Asian art scene, as well as viewing new photo and video works by established international artists. Read the exclusive interview of Nataline Colonnello, the Director of the Three Shadows Photography Art Centre in Beijing.